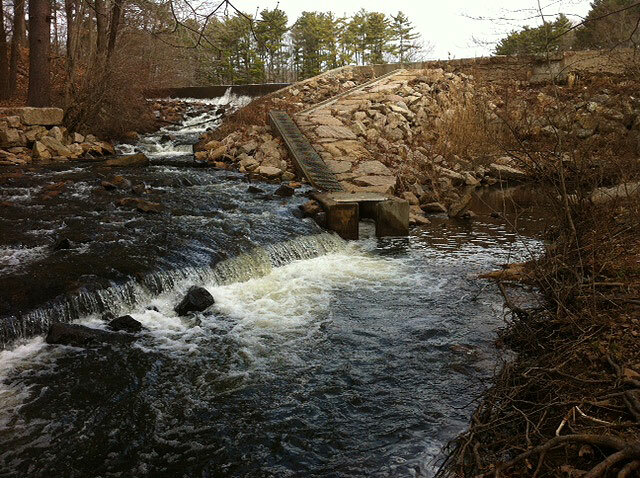 After two disappointing years for the river herring run up Queach Brook from the Branford River into the Supply Ponds, early signs suggest that 2014 could be another banner year. On April 2, two days after five inches of rain sent a surge of water down Pisgah Brook into the Supply Ponds, visiting DEEP fisheries staff found a dozen or more fish at the base of the fishway and a the fish counter at the top had already recorded 62 fish passing through. We have one of the earliest runs in the state this year, along with Bride Brook and Pattaganset River in East Lyme and Mianus River in Greenwich! The Supply Ponds Fishway was installed in December 2005 and opened for business in April 2006. Over 3,100 alewives and blueback herring (collectively called ‘river herring’) ran up the fishway in 2006 to spawn in the Supply Ponds as well as the upper waters of Queach Brook. While it is technically possible for these herring to travel all the way up to Lindsley Lake and even to Cedar Pond, we have not seen evidence of these fish in Lindsley Lake yet. Apparently, if river herring get into the lake they will quickly devour all of the big fat zooplankton – and, so far, there are still plenty of these slow zooplankton in the waters of Linsley Lake. Branford is very fortunate to have a fish counting computer installed at the top of the fishway. Migrating alewives have to swim through 5” wide plastic tubes before getting into the ponds. Each time a fish goes through a pipe, it changes the conductivity of the water just enough to trigger a count by the computer. We are even luckier to have Dr. David Post, a professor at Yale maintain the counter. Dr. Post is one of the world’s great experts on all things alewife-ish and we are lucky to have his excellent guidance. Most years between 2006 and 2011, the counter logged between 1,250 and 4,476 fish. The numbers spiked in May 2010 when we were seeing thousands of fish pass the counter each day and a total of 40,000 fish went over the dam to spawn in the upper watershed. 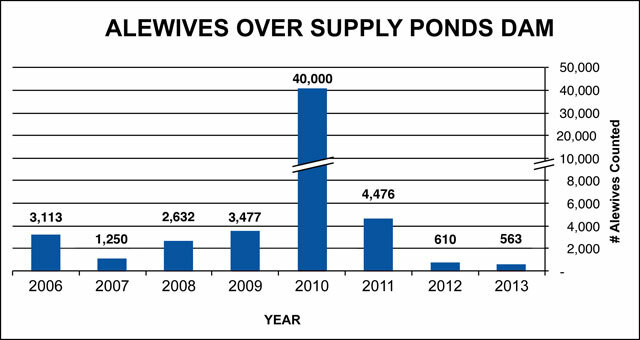 It was a different story in 2012 and 2013, when only about 600 fish were counted going up the fishway. There may be many factors that effect how many fish turn up in the Queach Brook run. In addition to natural population fluctuations, low water flows in April and May of 2012 and 2013 may have made spawning below the fishway seem like a better option than going over the dam. And the record runs at Brides Brook in 2013 (over 360,000 fish for an all-time record!) and big runs nearby (in the West Rivers in Guilford and in New Haven) may suggest that our Queach herring got swept up with their cousins’ enthusiasm and ran up new and different rivers. We just do not know…but that is partly the fun of this process. A more general worry is that the big midwater trawlers that catch Atlantic herring off Cape Cod and in the Gulf of Maine are scooping up the river herring from Queach Brook and other Connecticut streams. River herring like to school with their salt water-spawning cousins that these trawlers target and probably get caught as a by-product of the fishing effort aimed at Atlantic herring. Atlantic herring are used as lobster bait, fertilizer and fish and animal feed. Fortunately, the Pew Charitable trusts and their Herring Alliance allies have gotten NOAA to require federal monitors on these big ships to get accurate numbers on the amount of river herring being caught. See http://www.pewenvironment.org/news-room/press-releases/big-win-for-small-fish-protections-approved-for-forage-fish-on-the-east-coast-85899400629. Hopefully, we will soon see fishery regulations which will protect river herring at sea and lead to larger returning classes of breeding stocks to Queach Brook. Bengt Kjellberg deserves special mention as the 2013 volunteer of the year. Bengt cleaned the fishway daily during the run. Also, he cut up and helped move two massive pine trees that fell near the fishway entrance in the spring and fall. The fishway is located on the west side of Short Rocks Road, about 300 yards off of Mill Plains Road. Park on the street nearby the entrance (you will see a 3’x5′ green sign on the right). The GPS “address” is 14 Short Rocks Road, Branford, CT. Call Tom Cleveland at 203-981-9040 if you have any questions.